Hi, Good Morning. Thank you, friends and viewers. 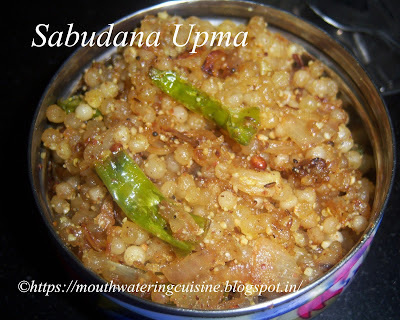 Today I will post how to make sabudana upma recipe. Sabudana kichdi, sabudana vada or sabudana upma are consumed during fasting days. Simple and easy to make yet delicious. Soak some sabudana and saute it along with onions and green chilies. Sprinkle some groundnut powder and lemon juice. Get a nice tangy and spicy taste. I know only two ways of using sabudana, making vadiyalu or fryums and payasam. We came to know about kichdi, upma and vada through different TV shows. I make all of them but liked upma and kichdi. Vada are also yummy, but they absorb a lot of oil, so I avoid making them. It can be served during breakfast, dinner or anytime we wish. Before soaking sabudana, to make upma or kichdi, wash them thoroughly. Wash them till the white residue goes off. Then only we can get granular upma or kichdi otherwise, it will be lumpy. If using small size sabudana sprinkle a little water at a time for soaking. And need not soak for a long time. If using bigger ones then add a little water and have to be soaked for a longer time. Sabudana Upma -- A low fat dish for breakfast. Wash and soak sabudana for three to four hours. Dry roast 1/2 cup of groundnuts and make coarse powder and keep it aside. Heat oil in a kadai, add mustard seeds, cumin seeds, black gram, bengal gram and red chillies. Once they start spluttering add curry leaves, chopped onions and green chillies. Fry them till the onions become translucent. Add soaked sabudana and saute well. Let this cook for five minutes. Add groundnut powder to it and mix well. Switch off the flame and drizzle it with lemon juice of half a lemon. Mix well and sprinkle it with coriander leaves. Serve hot sabudana upma with curd immediately. For more breakfast click here.Thank you for visiting my blog. Hope you liked all my recipes. Any feedback and comments are appreciated.